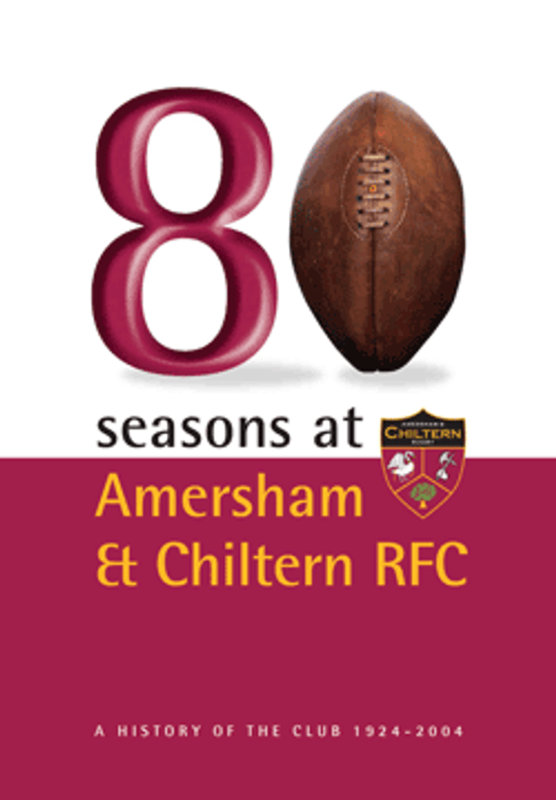 A history of the club from 1924~2004 "Eighty Seasons at Amersham & Chiltern", by Roger Cook is available to download. The Club was formed on 20 December 1924 when a committee was appointed comprising D.S.Richardson, H.W.Halton, A.W.W.Side, K.E.Halton and E.A.Redfern as Secretary. Captain Ivor Stewart-Liberty, the proprietor of Liberty in London, became President, a position he held until 1949. His close friend G.D. 'Khaki' Roberts (England, Harlequins & Oxford University) became coach. The idea of a rugby club to serve the expanding community of Amersham came from E.G.Halton, who had been a keen rugby player representing his club at the historic meeting of the RFU in 1893 when it decided to break from the Association of Northern Clubs. He suggested the Club be named Chiltern. The committee originally added a Wanderers suffix. Claret and white colours were adopted as Eric Redfern spotted a reduced price on a set of rugby shirts in George Lewin's Sports shop while working in the City of London. On Friday 26 December 1924 Chiltern Wanderers played its first game losing 0-28 against Old Berkhamsted School XV. Following the match a fixture list was drawn up for the rest of the season against RAF Halton, Old Merchant Taylors, Wasps, Civil Service, Thames Valley (Maidenhead), Lensbury, Old Whitgiftians, Park House, National Bank, Old Paulines, Arlington and HAC. Eric Redfern was empowered to find a home ground and eventually local landowner and farmer E.Forward offered one behind The Pineapple public house in White Lion Road, Amersham Common. Now with its own home ground, Wanderers was dropped and the club's official name became Chiltern RFC. This and a field in Cokes Lane were used as home pitches until part of the current ground was leased from the Shardeloes Estate in 1929. The ground with two pitches and a new pavilion was formally opened at the start the 1929/30 season with a game against West Herts FC. Included in Chiltern’s team was John Evans who had been transferred by Lloyds Bank to its Chesham branch but who returned to his native Wales the following season, eventually to become captain of Newport, Barbarians and Wales. Chiltern’s facilities attracted many notable members including Baron Widgery (Lord Chief Justice), Geoffrey Roberts KC (the famous prosecutor), D.G.A.Lowe (double Olympic gold medallist), Colonel 'Freddie' Baker (WW1 hero) and Dr James Gardiner (Olympic silver medallist). During WW2 the club lost a third of its playing members, amongst them Captain Jack Grayburn who was awarded a posthumous Victoria Cross for his part in the defence of the Arnhem Bridge. Rugby took until 1946 to re-organise. Chiltern only played 17 games that season but thanks to new recruits that included Trevor Davey and 'Dickie' Stuart-Prince the club soon was back to strength. The 1949/50 season witnessed the best results since the Club’s formation; First XV won 19, lost 3 and drew 3. The 1951/52 season results turned out to be the best ever recorded at Chiltern; First XV won 20, lost 2 and drew 1. In 1955, Chiltern fielded a youth team which for the first time was officially called Chiltern Colts. On 12 May 1959 the clubhouse caught fire and burnt to the ground. The committee chaired by W.N.D.Lang, a senior director of Wootton, James & Lang, set about raising £1000 to build a replacement which was achieved thanks to a £500 donation from J.W.J.Moir, the 1931-33 club captain, who was Managing Director of Rockware Glass. The new clubhouse was opened on the 21 September by J.A.Tallent O.B.E, President of the RFU, with a match against a President’s XV. At the same time the committee purchased the land it was leasing from the Shardeloes Estate together with access from Weedon Lane, now Ash Grove, from the Mathews Trust. Over the next ten years the Club’s playing strength gradually increased under the captaincies of Colin Pegley, Brian Arbib and John Adey and social activities were resurrected. By the end of the decade the Club was fielding seven senior sides every week and a formidable First XV had been formed under Clive Newton as captain. This included two past international players, Bill Patterson and Peter Stafford, and it won through to the first ever Bucks Cup Final in 1969, losing to Aylesbury after a replay. To cater for the increased membership £5000 was raised to fund additional facilities. The extended clubhouse was opened on 16 September by Neville Compton, President of the Bucks County RFU and former Wasps player. A match against a Bucks County XV to commemorate the occasion ended in a 11-3 defeat for the Club. In 1973 Tony Hale, Eddie Stephens, Dave Springford and Eric Planken-Bichler started Mini Rugby at Chiltern with the first mini game played on Sunday 28 October. In 1974 the Club’s 50th Anniversary was held at the Bell Hotel, Beaconsfield, with J.D.Currie (England) and J.J.McPartlin (Scotland) as principal guests. In 1987 after 10 years of relatively disappointing results, Chiltern finally won the Bucks Cup beating Marlow 9-8 on a muddy pitch. The Club, now renamed Amersham & Chiltern due to the advent of Chesham RFC, again won the Alan Grimsdell Cup in 1997 beating Olney 18-7. Playing with captain Mark Littlejohn that day were Alan Simmons (England, Barbarians and Wasps) who had joined the Club as a junior and David Choules who had returned to the Club after several seasons with Wasps and Saracens.